For picnics, barbeques, and outdoor dining on the deck or patio, you can't go wrong with this hybrid solar oven. 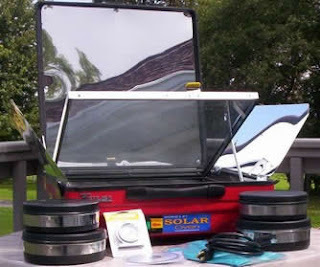 No propane to deal with, no charcoal or starter fluid, just an electric cord--and that's optional because the solar oven can run entirely on solar power. If you need to plug it in and use electricity, you'll be happy to know it uses 75% less power than a conventional oven. The recycled flip flop mat. Yes, it's been around for a few years, but like all good things is worth mentioning again. 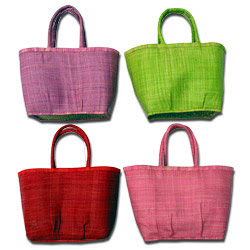 Made from recycled rubber flip flops, it's colorful, eco friendly, lightweight, durable, and just plain fun. Small mat measures 15 in. x 26 in. Yes, vegan fans, there is now a vegan nail polish (varnish or lacquer to some) available. It's from SpaRitual and is Phthalate (DBP), formaldehyde and toluene free. Not only that, buy a six-pack of the eco-color, Aware and 10% of the proceeds will go to the Go Green Initiative. 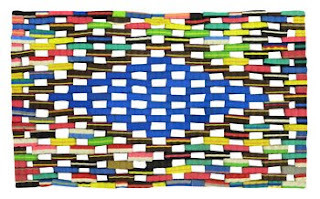 This cute clutch is handmade from recycled paper--700 strips of paper interwoven with magazine clippings of flowers to be precise. Each bag takes about two days to complete. The paper strips are protected by recycled plastic. Made in Mexico with zipper close and leather wrist strap. Measures 5 in. x 10 in. x 1 in. Los Angeles, CA based Urban Woods makes all of their sustainable furniture from reclaimed wood local to LA--harvested, milled, and seasoned in the California sun. Cushions made from organic cotton upholstery. Shown here is the club chair from the Melrose Collection. 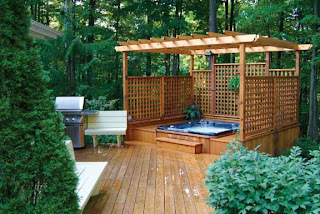 The greenest (read: eco-friendly) hot tubs and spas available are those made by Hydropool, meeting or exceeding the CEC (California Energy Commission) standards for energy efficiency. Hydropools are also the first spa in North America with a carbon neutral footprint. I've seen Primo water at the grocery store but never paid attention to it until recently. The water inside the bottles is purified via distillation and reverse osmosis but it's the bottle that attracted my attention because it's plastic made from plants. The plastic, whose trade name is Ingeo, is the first bottle made from a renewable resource (plants) and not petroleum products. Looking for an eco-friendly dollhouse? 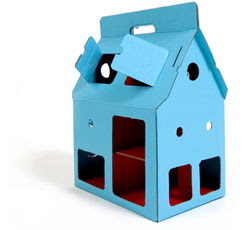 This pretty blue dollhouse is made from recycled cardboard, and of course can be recycled itself. The portable dollhouse has 8 secret rooms and an attic. Designed by Peter Henkes, Romy Boesveldt, 2006. Ages 6 and up. Measures 18 in. high x 14 in. 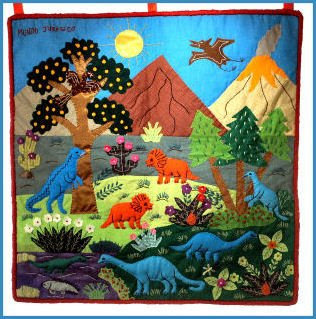 wide x 9 in. deep. These beautiful, stylish, and modern looking lamps are constructed from recycled materials and glass block. Uses a 7 watt bulb so it's more for mood lighting and atmosphere than reading. Designed by Kansas eco-artist Suzanne Perry. DEsigns vary from French poodles to martini glasses to snowmen and ferns. 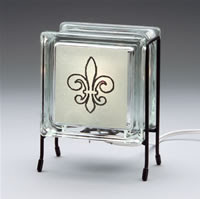 Fleur de lis glass block lamp shown here. 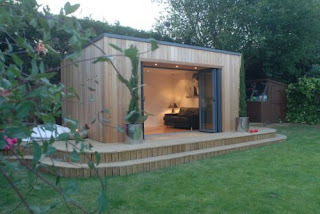 I would love to have one of these Qube garden rooms. Just think your own retreat, gym, or office right in the back yard! Qubes are constructed from Structural Insulated Panels (SIP) on a concrete pad. SIPs are environmentally friendly for a few reasons. The outer skins are made from engineered wood derived from renewable forest resources. The foam insulation saves on heating and electric bills, and SIPs replace conventioanl frame construction. This, my friends, is probably the coolest, most planet friendly laptop bag you've ever seen. 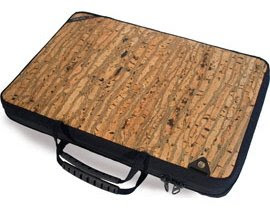 Made from sustainable cork it's both functional and stylish. Dubbed The Archetype, it's designed for the Apple MacBook Pro. Two sizes, shoulder strap optional. Let me start by saying that I think I like the packaging as much as the toothbrush. This is a great little replaceable head toothbrush that is made from wood Fiber blended with PLA, a plastic derived entirely from Nebraska maize. Since it's made from 100% renewable resources, that makes it one of the few eco-friendly options in toothbrushes. More importantly, it's reversible so it can be used for right and left-handed people (like me!). Radial bristles--4,000 of them made from Tynex® nylon. And if that's not enough to entice you, the company was founded by two architects on the Caribbean island of Tortola who were "fascinated by the idea of a functional and enjoyable toothbrush". And there you have it! We love bamboo here at The Eco-Modernist and this sleek, modern bamboo kitchen cart is no exception. Great for apartments or homes with small kitchens. Parquet cutting surface, food grade adhesives, towel racks, cabinet, and drawer. 26 in. x 26 in. x 36in. Silestone countertops from the Texas-based company Cosentino USA, are a stylish alternative to granite and other stone countertops. Made from quartz slabs, the material is suitable for just about any indoor surfacing application from bathrooms and ktichens to tabletops and fireplace surrounds. 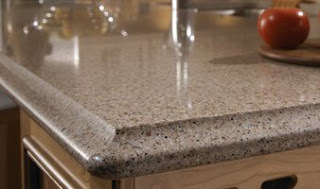 With four times the strength of granite, it Silestone quartz countertops are naturally stain, scratch, and scorch resistant, as well as maintenance free. Cute! Made from recycled wood, this birdhouse is a great garden accessory and sure to please your feathered human friends. Comes with wrought iron stand. Totally retro, totally eco-friendly, and totally cool! This clock is made from recycled 45 pm vinyl records. This sure brings back memories--even that yellow adapter gizmo in the center that enabled you to play the 45s on your record player. Fun for kids and adults. 7 inch disk, rock or soul. This beautiful molded and hand blown "balloon" terrarium is made from recycled glass. Part sculpture, part terrarium it resembles a Claus Oldenburg work. From Portland-based Esque Design; Justin Parker and Andi Kovel, artists. 10 inches high.